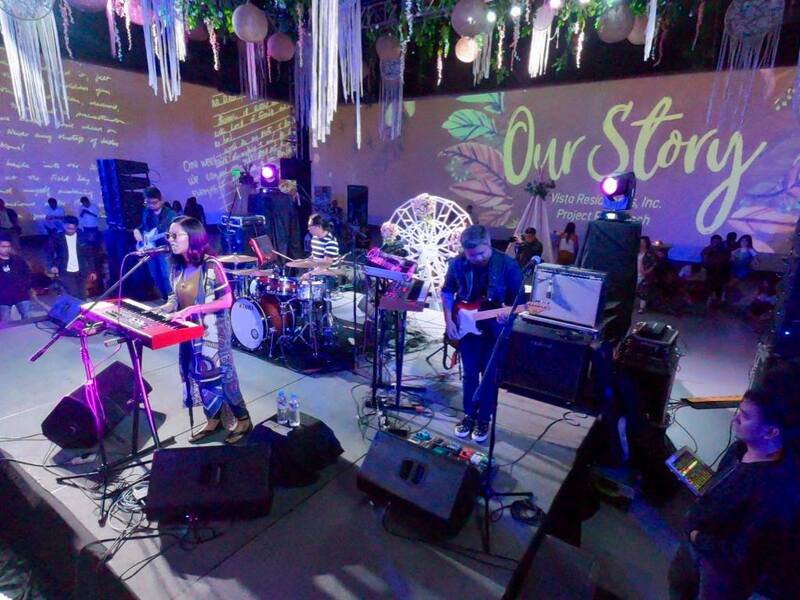 When we were just students, we all have our piece of a story about our high school or college life. It has its own ups and downs - some we have almost forgotten, some we still couldn't for we experience it until now. One part of our story as a student which lingers up to now is the nightmare being brought about by traffic, which is the students' major woe in their everyday adventure in going to school. This year and the next year, the scenario might be even worse as it is expected that the traffic rate will increase by 25%, which means from the usual 2 - 3-hour daily traffic, students will be stuck on the road for up to 4 long hours! Vista Residences, the condominium development arm of Vista Land already expected the situation and come up with a solution. In the event, Our Story; Vista Residences showcased the launch of five university projects that were renamed to create a more academic, student-centered vibe of the projects. Vista Residences takes pride in building for the nation's future leaders. This is by truly understanding the journey of students and the pressure and difficulties that come with it. Vista residences believe they deserve nothing but the best so they have been very dedicated to creating better living options for them – the birth of the University Series Projects. This newest project features impressive towers equipped with rooms and facilities designed around students’ needs including an e-Library, gym, pool, function rooms, ample parking, a commercial floor, and top-of-the-line security features. Got amazed by this move from Vista Residences because this could lead to a more focused, stress-free daily life for every student. They can spend ample time in studies or school activities and be on-time at work rather than getting stuck in a traffic jam. They could have more quality time, space and ease of access in addition to quality education and work productivity because of this project. Since its launch in 2003, Vista Residences has become a formidable player in the fast-growing vertical development sector of the real estate industry. Vista Residences continues to address the rising demand for condominium living with over 50 mid and high-rise towers across the country’s most progressive business districts. Vista Recto will now be ORWELL HEIGHTS, named from the English novelist George Orwell who was popularly known on his works about awareness on social injustice, literary criticisms, and support on social equality. Vista Plumeria will now be PLUMERIA HEIGHTS, named after the flower that once grew and bloomed profusely in Manila, more popularly known by its local name kalachuchi. Vista Heights 2 will now be named as TENNYSON HEIGHTS from the British poet Alfred Lord Tennyson who became known when he was appointed as Poet Laureate during the era of Queen Victoria. Vista Laong Laan will now be BRADBURY HEIGHTS named after the American author and screenwriter Ray Bradbury. Vista Katipunan 3 will now be named HAWTHORNE HEIGHTS from the American novelist, dark romantic and short storywriter, Nathaniel Hawthorne. Vista Residences is also proud to launch two Prime Properties in this event. Firstly, the Suarez Residences Cebu is the first development of Vista Residences in the Queen City of the South. Designed to create the ideal human habitat by responding to life’s necessities, Suarez Residences Cebu is master planned to redefine condominium living – a shopping center, hotel and residential hub in one tower; a perfect investment for those who are working or studying in uptown Cebu. Lastly, Encore South Triangle – is a 32 storey development that will stand along Eugenio Lopez Drive; a short distance away from ABSCBN, and GMA, Trinoma, SM North EDSA, Miriam College, Ateneo de Manila and UP Diliman. Our future leaders deserve only the best, and for this country to be back to its glorious phase, we should start giving our students state-of-the-art facilities for better living options while in school. 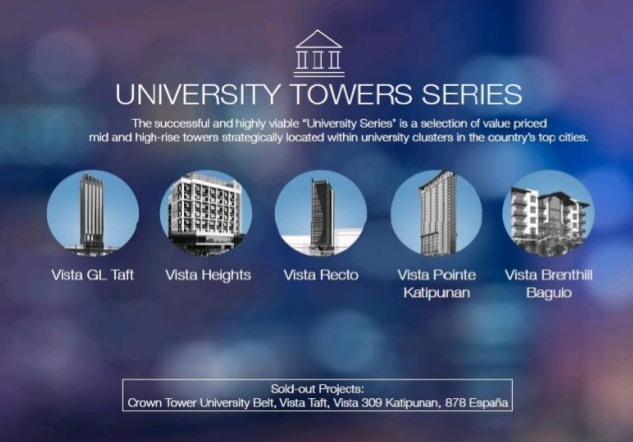 We should provide them with better and safer accommodations, as well as pro-student facilities and services, and that's what this University Series from Vista Residences is all about. Visit http://vistalandresidences.com/ for more info and inquiries.